Time for another adventure in cooking as part of Grow It Cook It Can It's Cook It! 2012 challenge. This one was a bit trickier for me. Why? Well, first because I had to research what the hell lactofermentation even means. In a nutshell, it's an old, natural process by which veggies are fermented using salty brine. OK, it's essentially rotting, but it's good, yummy, controlled rotting, not like the kind of "fermentation" that happens in the bottom of my crisper drawer when I forget about a bunch of cilantro. The addition of the brine means that the veggies produce lactic acid that will kill off the bad bacteria and prevent complete putrefication. 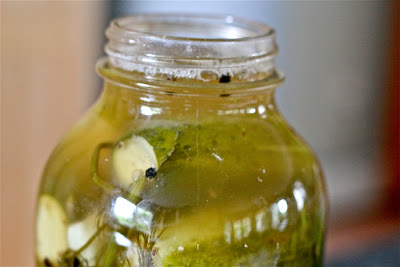 If you do a little research, the main foods that pop up as being best for lactofermentation are sauerkraut and kim chi. Hmm. Not so much for me. Then I realized that one of my favorite things in the whole world is lactofermented: deli-style dill pickles (usually made in a large crock). Flash back about six years, when the Ninj had just been bitten by the local, sustainable, shun-all-things-processed food bug (after reading Barbara Kingsolver's Animal, Vegetable, Miracle which completely changed my life and led me to where I am today). I decided to try my hand at crock pickles, since I hadn't yet ventured too far into canning and all it appeared I needed was some sort of crock. Let's just say it was a one-time thing because I got to witness first-hand what happens when lactofermentation goes horribly wrong (probably my fault) and turns into putrefication. But I'm an older, wiser Ninj now, so I figured this was a great opportunity to redeem myself in the area of lactofermentation and end up with some yummy pickles to boot. Guess what? IT WORKED! And in only three days! For my pickle experiment (yes, yes, I know cucumbers aren't in season but I don't create the challenge agenda, friends), I used a combination of "recipes", based on a couple of credit-less how-to printouts I had from six years ago and the no-nonsense guidance of Sophia at The Girls Guide to Guns and Butter (for her, these are traditional Russian pickles, but they taste the same as what I know as deli-style pickles). And I opted for canning jars rather than the large-mouth crock. 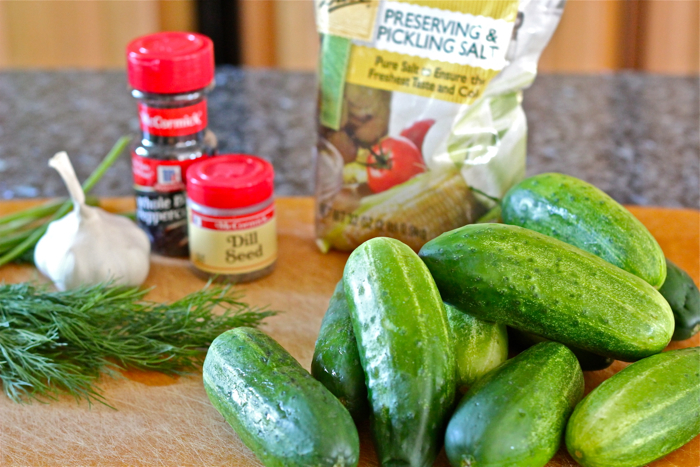 Gather a bunch of Kirby-sized pickling cucumbers, the smaller the better. 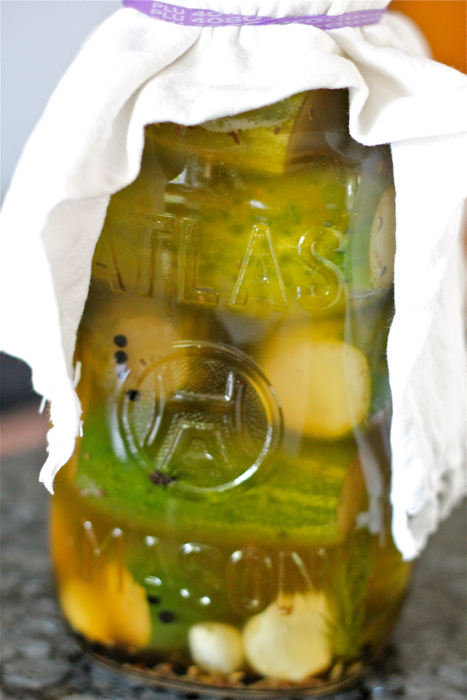 I used an old two-quart Mason jar that belonged to my 100-year-old grandma, so this was about 10 pickles for me. 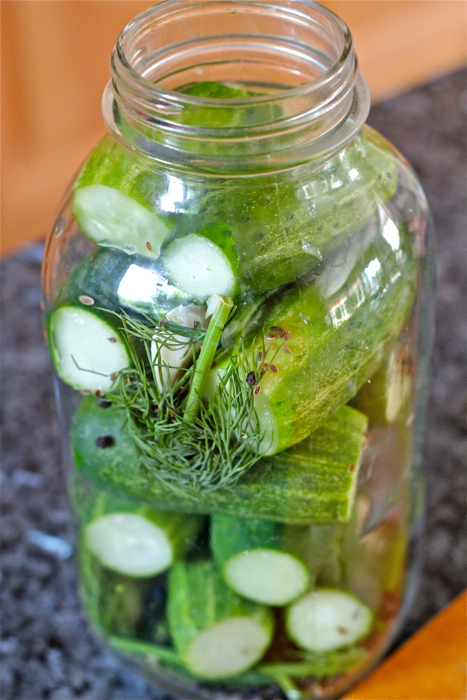 Also get yourself some whole stalks of dill, dill seed (since my dill didn't have heads/seeds yet, this early in the year), whole peppercorns, peeled cloves of garlic and PICKLING SALT (given that we are moving into canning season, this is easily found wherever canning supplies are sold). Wash the cucumbers well using a vegetable brush and cut a small slice off of each end. 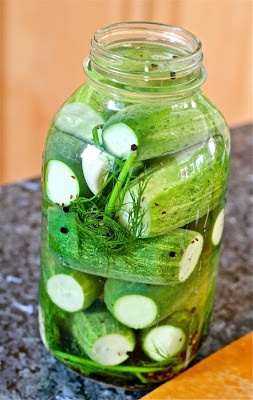 Pack the cucumbers TIGHTLY into the jar, intermingling them with the garlic (I used 4 cloves), peppercorns (I used 2 tablespoons), dill seed (I used 2 teaspoons) and stalks of dill (I used three). You want to really wedge it all in there to prevent anything from floating to the top after you add the brine (IMPORTANT: this could totally screw up the process, as the veg needs to remain submerged). Now, boil up some brine. Add 3 tablespoons pickling salt to 2 quarts of water and bring it to a boil, boiling until the salt is completely dissolved (not long). 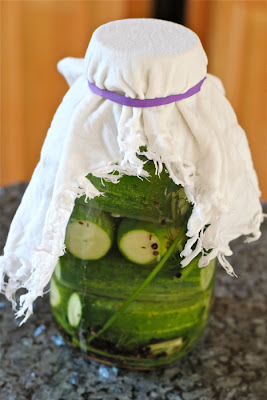 Pour the hot brine into your jar(s), ensuring that all the cucumbers are completely covered (I filled it right up, leaving only about 1/2-inch of headspace at the top of the jar). 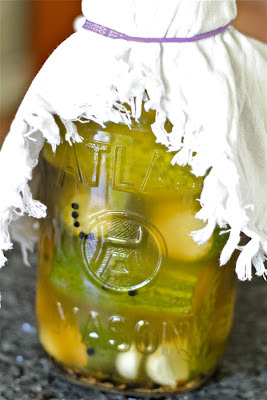 Top the jar with a clean, damp cloth and secure it tightly with a rubber band. Leave the jar on the counter. I love how mine looks like a sheik! So the assembly was easy. Now comes the waiting and hoping that everything works. If it does work, you should expect to see tiny little bubbling action (like slightly fizzy soda) in a couple of days. Everything is looking a little less green and crisp and more cloudy and brown. THIS IS GOOD, NOT BAD!! 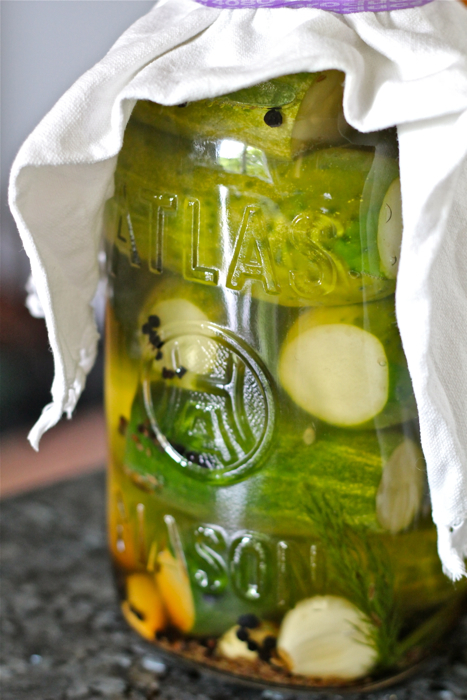 Also, smell the top of the jar (don't remove the cloth) -- it will totally smell like dill pickles, I swear! Definitely getting browner and more dill-pickle-like -- and we can see some little bubbles. Sophia suggests only leaving them about 3-4 days and I've decided not to press my luck -- I don't want to end up with rot as I did the last time. When you remove the cloth, the brine will be very brown; also, don't be surprised to see some bubbly "scum" on the top -- that is totally normal and harmless (skim it off if you can). Day 4: Bubbly "scum" is OK! The result? Very delicious dill pickles, somewhere just between a half-sour (my favorite because they are so crispy) and a full-on dill barrel pickle. These maintained a lot of cucumber crispiness but were definitely heavy on the sour dill side. 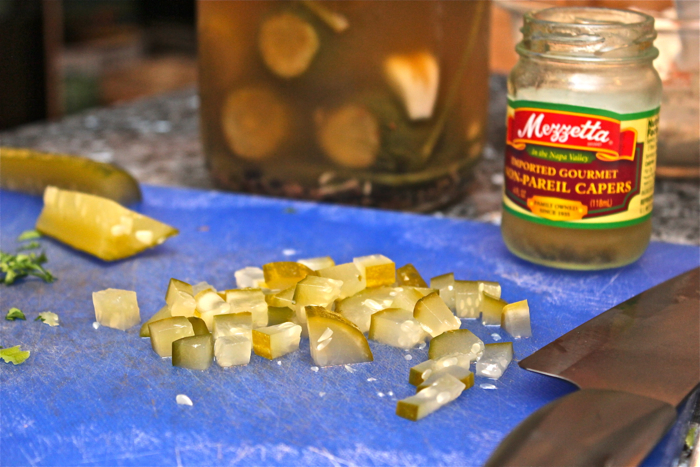 At this point, pop a lid on your pickles and put them in the refrigerator -- the cold will dramatically slow down the fermentation process so they keep for a bit. But definitely eat them within about a week, as the fermentation doesn't stop completely. You don't want them to end up like the aforementioned cilantro in my crisper drawer. Now, regular readers will remember that part two of the Cook It! 2012 challenge is to use the challenge ingredient in a recipe. Since "sliced pickles on a plate" seemed like cheating (even though that's how we ate most of them), I decided to make you a remoulade. Dude, I love me some remoulade. 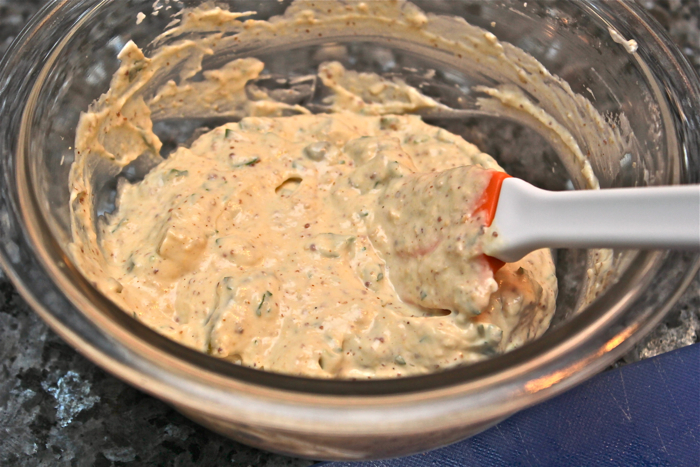 I discovered remoulade while living in New Orleans (makes sense, given that it is French in origin) and fell in love. There are so many different versions, some spicier than others, but at a basic level, they all start with mayonnaise and good mustard (I can see a whole new post here someday, if I made my own mayonnaise, mustard and pickles -- ooh la la!). This "recipe" is my own concoction, so don't feel constrained by the rough measurements I provide -- add more or less of whichever ingredients you like or dislike and taste along the way. 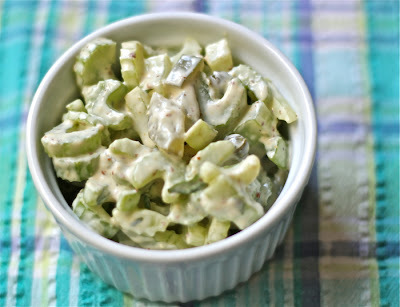 Also, as shown, I use this remoulade as a dressing for sliced celery, which makes a super-quick, super-easy side dish that's a great alternative to coleslaw when serving grilled burgers or steaks. 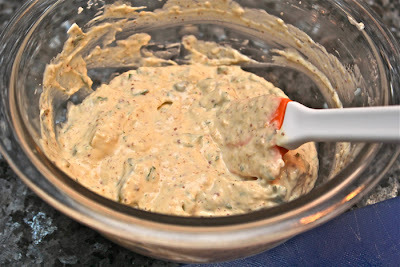 But be sure to make extra because it's also amazing as a dressing for shrimp salad or as a topping on salmon burgers. Combine all the ingredients and chill briefly. So, have you lactofermented anything lately? Or does this adventure inspire you enough to give it a try? The Ninj wants to hear from you. Despite the words "rotting", "putrification" and "scum" appearing prominently in this post, not only did I read to the end, but also I decided I'll probably try this recipe. Now there's loyalty! I have one other pickle lover in the house, and cucumbers are totally in season way down here in Huntspatch. I've even picked a few from my pathetic 'garden', although they're really twisty and probably the wrong kind; does that matter? I'll keep you posted; hopefully this won't get relagated to the bottom of the growing "recipes I'm going to try" pile. That IS loyalty! :-) But I know how you like pickles -- you will definitely love these! What--pickles on a plate aren't a recipe?? Even when you add some salami and hunks of cheese? 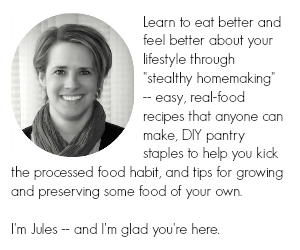 I like step-by-step instructions with visuals, Eileen, so I can compare mine to the example and see if I've screwed it up or not. :-) Good luck -- please report back if you give these a try! Im still frightened. The putrid and rotting part really got to me...and I might be the only person I know who does not like pickles. You are so lucky, Aimee! Ok...so this is really cool...I have read lots about Lactofermentation but now you have convinced me to really give it a try. Oh and Barbara Kingsolver's "Animal, Vegetable, Miracle" also changed my life completely too. I grabbed that book at Costco for some reason and things have never been the same since. Cool -- what a coincidence! I loved that book. Please report back if you try the pickles, too.